Alzheimer's Moments: Third Cat Discovered! Mom insists we have three cats here. There are only two, as I have affectionately referred to them on this blog as Cat #1 and Cat #2. She's always doing a head count on where all the cats are and she can never find the third. She knows we have one, but when I ask what its name is or what it looks like, she doesn't know. She just insists we have one. Well, on my desk to the right of this computer where I write all of these little tidbits of life, is a photo of the cat that I had for 16 years when I lived in California. 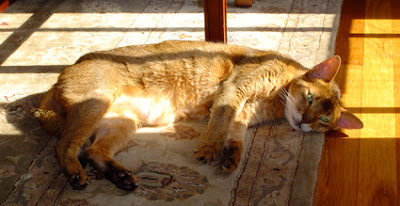 He was a beautiful Abyssinian and she had met him on visits out to CA. The other night she was looking at the picture and asked me to remind her of his name. Then it dawned on me...he is the missing third cat! Just wished my mom a happy Easter, on the phone her mind wanders and she repeats a lot of things. Luckily I'm from a large family and my brothers and sisters visit very regularly every day...something I can't do from here. I still feel pangs of guilt, anyway. The cat story is very poignant and touching.